Middle East-United Arab Emirates-Dubai Posted this card on the way back from my recent India trip. 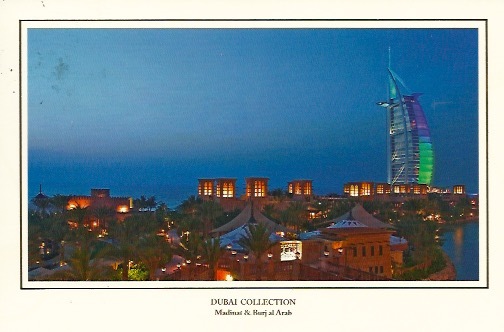 Here is a night view of Burj Al Arab which I think is a 7 star hotel. Many years ago in Dubai I visited and had dinner in the underwater restaurant and finished that off with a drink in the sky lounge. The biggest surprise was at the end. I was staying at a sister hotel and when I came out of the building they had a Rolls Royce to bring me back to my hotel.. Never to be forgotten. There is a 24 Hours Post office at Dubai Airport. You can buy stamps there and postcards in the shop just down the stairs. You cannot buy sets just complete collections. 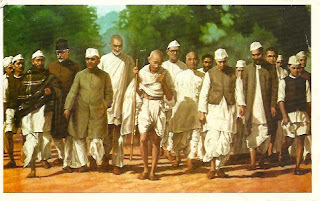 Asia-India-Ahmedabad This is a second postcard I purchased in the shop at Gandhi's headquarters The painting of this image is on view. 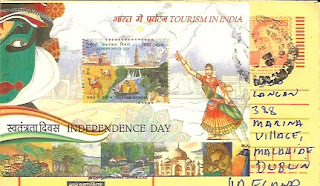 It's Olympic year so a good opportunity to use the latest Olympic stamps from India . One of the sports I had a big interest in is shown here. Badminton . I travelled Europe as a Umpire and enjoyed it very much. Apart from playing the game itself for many years. India won a Silver medal in this sport . 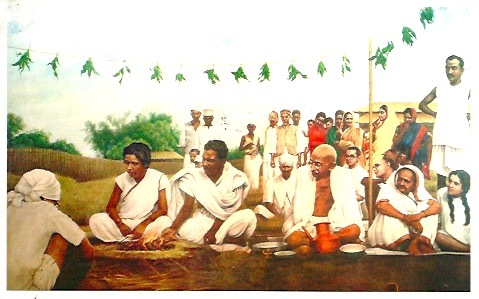 The Postmark is a special postmark and is only in use if you mail at the postbox outside Gandhi's Museum/Headquarters. Asia-India-Ahmedabad During my desperation to find a card in Ahmedabad I purchased this one sided card from the Post office. As it happens I was here for Independence day and India issued a stamp. So in memory of that special day I had to purchase this miniature sheet. It is also inscribed "Tourism in India"
Asia-India-Ahmedabad This is a postcard I purchased at Sabarmati Ashram the Gandhi's headquarters from 1917 to 1930 during the long struggle for Indian Independence. I was in this city for work so had one day to see some of its charms. With a population of over 5 million it was near impossible to find a postcard . I did find none of the city itself or the state of Gujarat. I would suspect it is not a state with a big tourist draw. Unfortunately I had to cover up some of the text on the back of the card. I mailed this at the GPO in Ahmedabad. There was a philatelic counter, but it was not manned. So after a few minutes I discovered it was in fact within the Post office itself. So it was there I was able to choose from a good selection of current Indian Issues. This is the inside of the Post office. A very busy office . This should be the Philatelic Counter but in fact it was not manned. The line is for something else. Rare maybe the first time I have put a photo of myself at work. Always enjoyable. Finally a icon of the city of Ahmedabad .. The window carved in stone . The Tree of life.